Any stylist or decorator worth her salt knows the value of a great basket. I am such a person. Lately I've gone a bit basket mad. Especially since visiting Maison et Objet, the design trade show held twice a year in Paris. Mr. A and I check out the show in September and I saw so many gorgeous baskets handmade lovingly but craftspeople from around the world. It is truly fascinating to me that indigenous cultures from such far flung and wildly different climatic/growing regions all each have a signature style (and of course materials) but are essentially making the same vessel. Entre nous my current basket wish list is located mostly in Brooklyn at HomeStories. I follow their Insta religiously and save save save images all the time. But when these lovelies landed in front of my face I put all thoughts of HomeStories away and began to imagine how sweet my little Pixie the Frenchie would look in one of these. 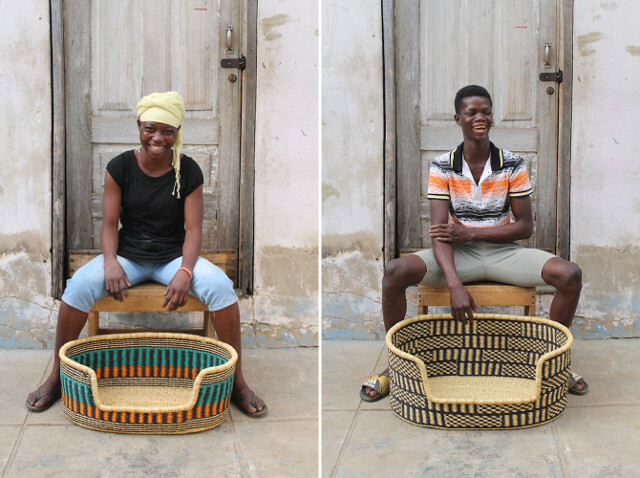 These woven dog beds are handmade in Ghana (fun fact, my brother lived in neighbouring The Gambia for a couple of years and spent some time in Ghana then too). These are the latest addition to the product line of Baba Tree, a company producing fair trade woven products and shipping them straight from Ghana to whereever you are in the world. amazing, right? Also amazing: Baba Tree photographs each product with the person who made it — and tells you each name! I have to say that I am as much swayed by those smiling faces and interesting expressions as the work they have done. It makes choosing favourites so much harder. See all the dog beds and a bajillion gorgeous baskets by clicking through to Baba Tree. And if you are a Canadian, don't miss their special instructions for Canadian shoppers.